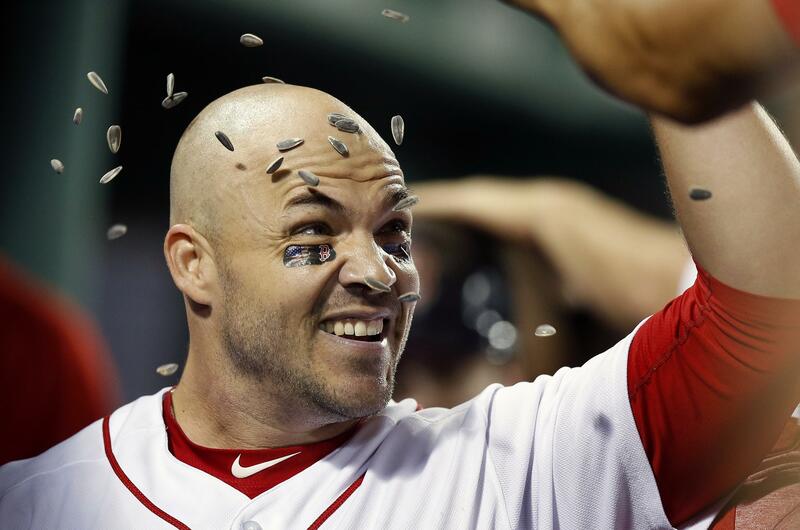 BOSTON – Steve Pearce homered three times, the second a three-run drive in an eight-run fourth inning as the Boston Red Sox rallied from an early deficit to beat the New York Yankees 15-7 on Thursday night and take a season-high 6 1/2-game lead in the A.L. East. Didi Grigorius homered twice, Aaron Hicks hit one and Giancarlo Stanton his 25th of the season for the Yankees, who have lost just twice in the past week but dropped two games in the division. Brian Johnson (2-3), making a spot start because A.L. ERA and strikeout leader Chris Sale went on the disabled list, fanned a career-high 11 for his first victory since April 2. Blue Jays 7, Mariners 3: Kendrys Morales homered in the seventh inning to back Mike Hauschild’s impressive Blue Jays debut, and Toronto beat the Mariners in Seattle. With two outs in the seventh, a runner on first base and the score tied 2-2, Morales hit a fastball from Juan Nicasio over the wall in right-center field. It was Morales’ 13th home run of the season. Hauschild, signed by Toronto after being released by Houston, was pitching in his first game in the majors since April 19, 2017. Felix Hernandez, whose spot in the Seattle starting rotation has been in question of late, gave up two runs in five innings. Dodgers 21, Brewers 5: Cody Bellinger hit a grand slam, Joc Pederson and Yasiel Puig hit two homers each, and Los Angeles hammered visiting Milwaukee. Brian Dozier and Justin Turner also went deep as the Dodgers finished hit a season high-tying seven homers, and also set season highs for runs in a game, and in an inning when they had nine in the seventh. Clayton Kershaw gave up two runs and five hits over six innings, winning his second consecutive start. He also won for the fourth time in his last six outings, while striking out seven with two walks. Giants 8, Diamondbacks 1: Madison Bumgarner worked through traffic in five innings to out-pitch Zack Greinke in a duel of aces, lifting San Francisco past Arizona in Phoenix. Bumgarner pitched with runners on in every inning, yet limited the Diamondbacks to a run on seven hits. He stranded nine runners and struck out five. Greinke gave up two runs on four hits and struck five in six innings to lose for the first time in nine starts. Cardinals 3, Rockies 2: Pinch-hitter Jose Martinez sliced an opposite-field single to the right-center field gap off Wade Davis with one out in the ninth inning, driving in the tying and go-ahead runs and lifting the Cardinals over Colorado in St. Louis. Greg Garcia singled with one out against Davis and took third on a single by rookie Harrison Bader. Bader stole second, and Martinez singled on a high fastball, giving the Cardinals their ninth walk-off win this season. Rangers 17, Orioles 8: Jurickson Profar hit a three-run home run and a run-scoring single as Texas scored 10 runs during the first two innings, Rougned Odor homered and walked a career-high five times, and the Rangers routed Baltimore in Arlington, Texas. Yovani Gallardo won his third straight start but lasted only 5 1/3 innings despite having a 13-1 lead through four. The 17 runs and 18 hits were season highs for Texas, while the Orioles allowed their most runs this year. Padres 6, Cubs 1: Austin Hedges hit a go-ahead, three-run homer, Robbie Erlin pitched two-hit ball over five innings in a spot start, and San Diego beat the Cubs in Chicago. The Padres ended a season-high, seven-game losing streak. Erlin allowed one run, struck out four and walked one in his third start this season and first since May 21. Four relievers followed in a three-hitter for the Padres. Nationals 10, Reds 4: Max Scherzer struck out 10 in six innings for his fifth win in as many starts, helping the Nationals beat Cincinnati in Washington. Scherzer also singled in a run off Tyler Mahle during a six-run second inning as the Nationals won their third straight and moved two games above .500 for the first time since July 7. Washington slugger Bryce Harper hit his 26th homer of the season, a blast into the second deck in right-center in the eighth. Mahle failed to make it through the second inning for a second consecutive start. Phillies 5, Marlins 2: Maikel Franco hit a three-run homer with two outs in the bottom of the ninth to lift Philadelphia past visiting Miami. Nick Williams drove in the tying run with a bases-loaded groundout off Kyle Barraclough in the ninth. Franco followed with a high drive on a 2-0 pitch into the seats in left. The Phillies remained a half-game in front of Atlanta in the N.L. East. Braves 4, Mets 2: Ronald Acuna Jr. led off with his first big league triple and reached three times, Johan Camargo hit a two-run double in a three-run third inning, and Atlanta extended its winning streak to four by beating the Mets in New York. Mike Foltynewicz won for the first time since July 11, allowing two runs and five hits in six innings. Three pitchers followed with one-hit relief as the Braves improved to 10-3 against the Mets this year. New York dropped a season-low 18 games under .500 at 44-62. The Mets have lost 41 of their last 60 games overall and 23 of their last 32 home games. White Sox 6, Royals 4: Jose Abreu hit a tying home run off Jason Adam in the eighth and pinch-hitter Daniel Palka had a three-run homer off Jason Hammel later in the inning, giving the White Sox the win over Kansas City in Chicago. In a matchup of teams on track to lose 100 or more games, the White Sox avoided getting swept in the three-game series. Rays 4, Angels 2: Jalen Beeks got his first major league win, C.J. Cron had a two-run single and Tampa Bay completed a three-game sweep of Los Angeles in St. Petersburg, Florida. Beeks, the second pitcher on a bullpen day, allowed two runs and two hits in five innings. Tampa Bay’s Hunter Wood struck out five and allowed one hit over the first two innings. Diego Castillo and Sergio Romo, who worked the ninth for his 13th save, completed a three-hitter. Published: Aug. 2, 2018, 10:10 p.m. Updated: Aug. 2, 2018, 11 p.m.